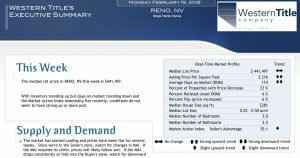 Brought to you by Western Title Company is this week’s Market Report! Having a realtor that is knowledgeable about your local market trends is essential for any buyer or seller. Which is why we, Nevada Gemme Real Estate, pride ourselves on staying up to date with our local market trends.